Seen enough Saw sequels? For horror fans, this Halloween weekend offers some alternatives to the standard big-screen fear-mongering. On Thursday, the Firehouse Center For the Visual Arts kicks off a weekly series of David Cronenberg screenings with Videodrome, the 1983 conceptual chiller that gave cinema the indelible image of James Woods popping a VHS tape into his abdomen ... and playing it. On Friday, the second Vermont Horror Fest takes over Outer Space Café, featuring a talk by director Rob Schmidt and a screening of his 2003 hillbilly-horror film Wrong Turn, starring Eliza Dushku. Organizer Will Peters says Schmidt “contacted me out of the blue and said he and his wife were new to the area and wanted to get to know some of the local horror filmmakers.” Also showing: two local shorts, “Dead Creek” by Mike Turner and “Midnight Roadkill” by Owen Mulligan. If you’re in the Upper Valley, check out a triple bill from the Dartmouth Film Society: Shaun of the Dead followed by a Norwegian Nazi zombie horror comedy (really) called Dead Snow. 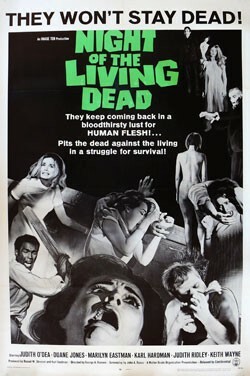 The goofiness gives way to black-and-white scares with George Romero’s original 1968 Night of the Living Dead. Sensing a theme? Saturday, October 31, at Spaulding Auditorium, Hopkins Center, Dartmouth College in Hanover, N.H. $5-7. Info, 603-646-2576.